It was an early 2000s comic book, most surely from the USA. I think it was the first number in a series. Four high school boys and girls find the body of a female superhero in the woods. Most of the story was about the lives of teenagers. One boy was a conflictive student with a dysfunctional family, one of the girls was obese. I've been searching the internet for "kids find dead superhero woman in the woods" without finding anything relevant and I don't recommend you to do the same. Bing gives many results with pictures of "dead women" and "dead kids". I'm afraid it's an usual search. 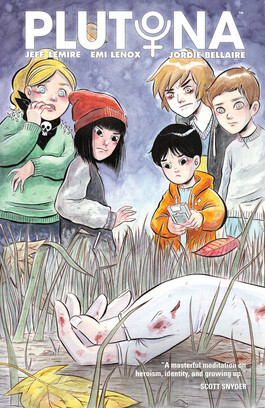 This is likely Plutona, a 5 issue miniseries by Image. Found via "comic book" "dead superheroine" woods on Google. The TVTropes entry has further notes of dysfunctionality in the families, although there are also some big spoilers. Abusive Parents: Ray's dad is a neglectful alcoholic who can't hold down a job. Sour Outside, Sad Inside: Ray acts like a jerk because he's insecure about his home situation. Given the opportunity to hang out with people he trusts, he's ok.
Not the answer you're looking for? Browse other questions tagged story-identification comics super-hero or ask your own question. What are the More Common Superhero Origin Tropes? Who is the highest selling non US comic book superhero? Comic female protagonist, pretty sure a goddess? Who was the first comic book superhero without a secret identity? Is the Concept of the Multiverse Unique to Superhero Comic Books?